Throughout the compilation of this book, we have selected the tool over the machine. The difference may be clear-cut in our minds, but not always so distinct in reality, since one and the same product may be a tool or machine, depending upon who is using it ?nd how it is being used. A brush in the hand of an artist is a tool. The printing roller that duplicates his painting a billion times into a wallpaper pattern is a machine. There is nothing wrong with a wallpaper machine (though wouldn't it be better if we all decorated our own walls?) just as there is nothing essentially right about an artist's brush. But there is a difference. Peculiar things begin to happen when that difference is extended indefinitely in human activity. The tool remains hand-directed and unhabituated; the machine becomes increasingly more automatic and addictive if its power is not curbed. If you let go of the paint brush, it falls on the floor; the wallpaper machine will go on making wallpaper while you sleep. Because it is so easy to produce with a machine, we inevitably let it produce more than we need. The machine can produce an unlimited supply of wallpaper, but there is never a surplus of art. Tools make unique products—each a little different from the other, each speaking eloquently of the tool's user. A machine deals in multiplied sameness no matter who or what operates it. Tlte best machine operators are other machines. The tool is fragile because it is individual. The machine is powerful because it is collective. In any contest where winning is measured in quantity, it is a mathematical certainty that the machine will win because it can always get there "the fastest with the mostest." As long as economics makes quantity the goal, the machine will devour the tool. And when all the tools are gone, the machine will devour lesser machines. For tyrants, the machine is the ultimate tool. While our supplies of cheap fossil fuel last, farmers need machines to continue to wrest Sand away from other farmers for the ultimate aggrandizement of agribusiness. In the new technology, homesteaders, gardeners, and small fanners can live well with tools and have much less need for machines. But they need lots of tools. The magic of any book, we believe, is in the possibilities it raises in the imagination of the reader. There are forgotten tools that could be made again—only better—and future tools not yet dreamed of. The ideas for them could spring from the obsolete tools of the past, so we have included pictures of farm tools from old manuals. Studying the anatomy of a 1930 tractor which is especially suitable to the needs of today's farmstead, a handy person just might be persuaded to build another one—or more. There is a strong heritage, especially in the United States but elsewhere too, of the farmer as inventor. A large percentage of our inventors came from rural communities, and virtually all the industries which grew up in the United States in the 1800s started on a very small scale, often as one-man operations. Cyrus McCormick, Oliver Evans, Eli Whitney, even Henry Ford— each grew up on a farm. The inventors of tools we still need will most likely come from the ranks of today's small farmers—and their children. Some toois now marketed for special pur poses have uses for growers that the equipment makers didn't foresee. We've tried to include these tools whenever we've been aware of them. For example, a supplier of orchard- and fruit-farming equipment manufactures a mulch spreader for the commercial strawberry grower. The spreader can be placed on a wagon or in the back of a pickup truck. Straw bales are fed into one end air' are chopped up and delivered out the back onto the strawberry plants. But the mulcher could be used to lay down straw or spoiled hay between raspberry rows, vegetables, or wherever the farmer needs it. 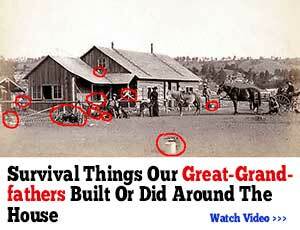 Common lawn and garden tools have uncommon homestead uses. A grinder-shredder will chop silage for cattle feed out of corn, pumpkins, mangels, or other plants. It will even grind a crude corn and cob meal for cows. A battery-operated hedge trimmer works fine for summer and winter raspberry pruning. A battery- or hand-operated sidewalk edger makes an adequate cutter for strawberry runners. A big ten-tined silage hand fork makes an excellent tool for handling mulching materials like shredded bark. The equally large hand forks we used to call barley forks, with tines closer together than those oi a silage fork, are good for shoveling sawdust mulch. Surely the futur: looks bright for tool users and toolmakers in the gardening and small farming field. Little imaginative thinking has gone into such tools because technology has been enamored with the concept of Big. All sorts of interesting ideas await development. We hope this book can help point the way.